If you happen to be near the Foreign Correspondents' Club of Thailand on April 2, why not drop in on a book signing for Bangkok Noir from Heaven Lake Press? "If noir is looking a little tired in the West, in Thailand it has all the energy and courage of a kid from upcountry who thinks the Khmer tattoos on his body will stop bullets." "[A] stab in the heart of noir darkness suggests that while many Thais embrace the materialistic aspects of modern Western life, the spiritual and sacred side draws upon Thai myths, legends and customs, and remains resistant to the imported mythology of the West. In the tension between the show of gold, the Benz, the foreign trips and designer clothes, and the underlying belief system creates an atmosphere that stretches people between opposite poles." Here's my interview with Timothy Hallinan. Christopher G. Moore needs no introduction, but I wrote one anyway, for his most recent book. Thanks for making me aware of this. The NOIR anthologies have been, to me, somewhat uneven, but the city chosen and the writers included make this one merit notice. Alas, I won't be in Bangkok, but this anthology looks promising. I've several of the Noir series on my short story shelf and have enjoyed them all so far. 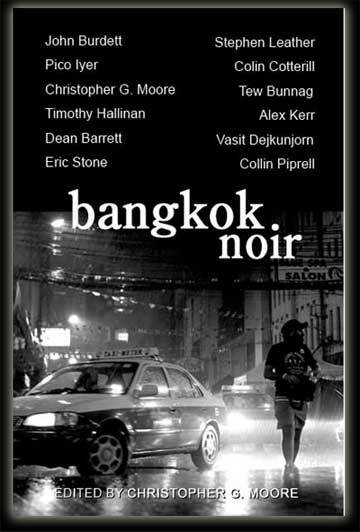 Christopher G Moore is the king of Thai crime fiction IMHO. Glad he's involved. Dana and C.B. James: For your information, if it matters, this book is not part of Akashic Books' "(Fill in the location) Noir" series. I had thought Akashic had already published a Bangkok Noir volume, but it apparently has not. I have several of the Akashic collections as well as this book and a non-Akashic Paris Noir. I.J., I put Hallinan's Breathing Water on my year's-best list for its year. Now I should read his latest, which was shortlisted for the best-novel Edgar award. C.B., John Burdett's contribution to the collection is a ghost story that works. Moore's remark about spirituality is apparently not just mumbo-jumbo. Jennifer, the collection is apparently Moore's project. He edited it and wrote the introduction, he contributed one of the stories, and the publisher is his publisher. I've read several of the Vincent Calvino novels. Moore's "cultural detective" attitude is unique in ctrime fiction, as far as I know. And a great introduction it was too. How do I know? Cos I just read it. I'm wondering what happened to the plans for a Belfast Noir...the time would seem right but I think the book got killed. I thank you for that gracious prelude to my introduction. Was Belfast Noir supposed to be part of the Akashic series? Next time get me to write the introduction to your introduction. If I get asked to write enough introductions that someone wants to collect them in a volume, you can write a foreword. Unless, of course, you'd prefer a preface. Seems like a lot of work, I'll just do the epigraph. Incidentally we just got a flyer about the local Purim review which is always pretty good. This year its called Anchors Oy Vey, a slight come down from last year's classic The Thirty Nine Schleps. OK, I need someone to coordinate all prefatory matter. Anchors Oy Vey is more than a slight comedown from The Thirty-Nine Schleps, I'm Afraid. I think whoever writes the Purim fliers in Adrian's city has a good Jewish wit, enough to cause some laughs, and a few "oy veys," at the corniness--fine with me. Will send this on to a few relatives who will laugh. Kathy, I tried for a few minutes to come up with something as good as "The Thirty-Nine Schleps," but I could not. I tried for just a few minutes, but I did try. Seana, I don't think this book goes as hard after non-writers as some of the Akashic volumes do, but it does range beyond the traditional somewhat. I have not read Pico Iyer's story, but he sure is an intriguing choice. Well, I do hope his noir does not go as far as to include his BFF, the Dalai Lama. v word= foesses. Which is kind of stretching a point. "Foesses and Femmes Fatales." Now, there's a title for a collection of short stories. I haven't read Pico Iyer's story yet and, while spirits do figure in John Burdett's, nothing I've read yet has included murdering monks and lamas. Whoa, and either way packs a punch. Some people get all the good v-words. Yeah, but at least I share. I'm old enough remember rare references to female professional golfers as proettes, and I love the references in P.G. Wodehouse stories to a bishop's wife as the lady bishopess. Foess is far better than the first and almost as good as the second. It sounds like the female counterpart to Lex Luther or the Joker. I don't remember proette, but probably should. It's funny that '-ess' is so much more dignified than '-ette'. That because -ette is a diminutive form amd sounds dismissive. That's why we have the duke and duchess, but not the duke and duchette. That because -ette is a diminutive form and sounds dismissive. That's why we have the duke and duchess, but not the duke and duchette. Right, I knew it was diminutive, but I wonder why it sounds so dimininutive. It's just the difference of a consonant sound. I know it's associative, but it's pretty powerful. Goddess versus goddette, for instance. Well, -ess seems ultimately to be derived from Greek, so the proverbially soft Latinate influence might be less. I think English speakers also regard words that end in consonants as stronger than ones that end in vowels. Right, so doesn't -ette seem like it would have a stronger connotation than -ess? Of course, there are always the rockettes to muddy the waters. Well, final consonants are stronger to an English speaker than final vowels. But the sibilant sound of -ess might undercut the strength that strength. And the vowel ending of -ette is silent, or almost silent, in English. So never mind. It's so silent that I didn't even think of it. "Silent Vowels" -- can you ever feel safe again? Definitely lioness connotes strength, but lionette? Never. I guess a lionette is handy when one has no room for a full-size lioness. Hi, Peter, and thanks for calling the collection to people's attention. And VERY belated thanks for picking BREATHING WATER as one of your favorites for 2009. This is actually the first I've known of it, or I would have thanked you a lot earlier. "And VERY belated thanks for picking BREATHING WATER as one of your favorites for 2009." John Lawton, or Which title is better? A non-crime post — or is it?